KOTA KINABALU: Parti Cinta Sabah (PCS), a multiracial opposition party, will be establishing up to 26 divisions based on the state constituencies, said its newly-elected president, Datuk Seri Panglima Wilfred Bumburing. Bumburing said PCS had obtained approval from the Registrar of Societies (ROS) to set up 26 divisions in Sabah. “We have prospective committees to form most of the 26 divisions,” he said at a press conference after the first Biennial General Assembly (BGA) of PCS here yesterday. The BGA also saw the election of the president’s post, three deputy presidents, three vice presidents and 20 Supreme Council members for term 2016 to 2020, with Bumburing replacing Dr Nicholas James Guntobon as the new president of the party, while the latter was elected as a deputy president. On his reform movement Angkatan Perubahan Sabah (APS), Bumburing explained that it was basically a non-governmental organization (NGO) which served as an introduction platform in the last election. He said the leaders and members of APS and PCS have also merged without any issues as they share common goals. While Bumburing won the Tamparuli state seat on Parti Keadilan Rakyat (PKR) ticket in the 13th general election (GE13), he maintained that he had never been a member of PKR. Upon further elaboration, Bumburing said his acceptance of the offer to helm PCS was because the party had in its Constitution to fight for the autonomy of Sabah. “The leaders and members of PCA are people who are committed to fight and struggle for justice in Sabah and Malaysia. “What attracts me in PCS is Article 5 of its Constitution – fight for the autonomy of Sabah. “There is no other party I know of that has the provision to fight for Sabah’s autonomy in their constitutions,” he said, adding that not even PKR had the provision in its Constitution. Bumburing said PCS would continue to develop its core values and finalize its charters. He also reiterated PCS’ commitment to the United Sabah Alliance (USA) and to make the coalition stronger. 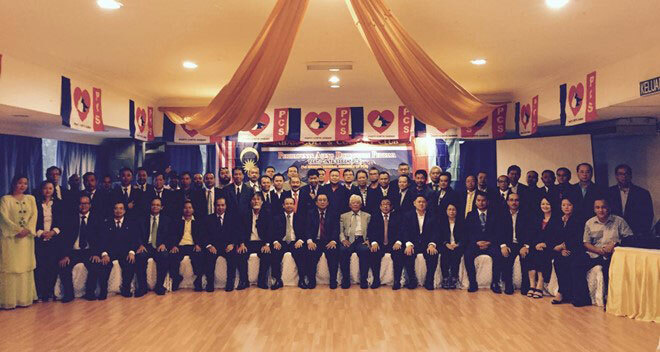 The alliance members of USA comprise PCS, Sabah Progressive Party (SAPP) and Sabah STAR. Earlier in his inaugural speech, Bumburing said he had wished and prayed that someone else was given the task of leading PCS. “Nevertheless, I have contemplated on the people’s plight, hope and aspiration deeply and I feel that I must contribute to the struggle to fight for the autonomy of Sabah within Malaysia as enshrined in the Malaysia Agreement 1963. “The political condition of our country today makes it even more important that every citizen who loves Sabah must not stand idle and watch the water passes under the bridge. “Nobody can afford to be a bystander any more. Meanwhile, PCS deputy president Paul Voon said the party would study and refine its existing core values and present them in a way which people could understand and identify with. He said the core values would be reflected in the charters of PCS, which needed to be endorsed by the Supreme Council. Deputy president Datuk Dr Richard Sakian Gunting added that PCS would continue to synergize its resources and come up with a plan for the party to be acceptable to all concerned in Sabah. Dr Nicholas, on the other hand, expressed his gratitude to Bumburing for accepting the presidency. The rest of the new line-up include Datuk Kalakau Untol, Amru Abdul Kadir, Datuk Herman Tiongsoh and Jaubin Paidi (appointed) as vice presidents, Jornah Mozihim as Wanita chief and Hasmin @ Azroy Abdullah as Youth chief. Kalakau is also appointed as the organizing secretary of the party. Petrus F. Guriting, Denis Gimpah and John Hussein were appointed as secretary general, assistant secretary general and treasurer general respectively.